This event is part of a series on the Intermarium sponsored by the Kosciuszko Chair of Polish Studies. Brandon Weichert will discuss how sanctions against Russia have exacerbated the decline of the European Union and how it has hit places like Poland the hardest. He will review the unintended consequences of sanctions and whether or not sanctions were the best U.S. policy towards Russia after Ukraine in 2014. CLICK HERE to register for this event! If you cannot make it, IWP live-streams all of their events as well and The Weichert Report will have their cameras there also. America Needs a New European Policy. Brandon J. Weichert is a former Congressional staffer and the founder of The Weichert Report. His book on national security space policy will be released shortly. Brandon holds a B.A. in Political Science from DePaul University and is an Associate Member of New College at Oxford University (GDBM!). Recently, Brandon obtained his M.A. 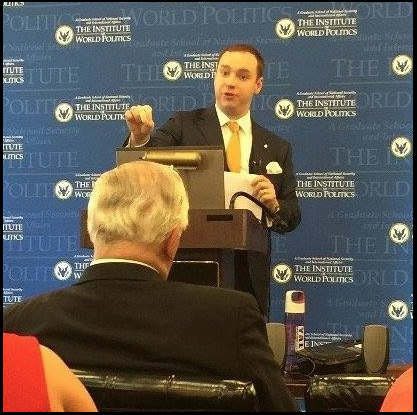 in Statecraft and National Security Affairs with a Specialization in Defense Policy from the Institute of World Politics in Washington, D.C.
On top of being a contributor to the conservative publication, American Greatness, Brandon does speaking engagements, presents papers, and conducts media interviews. He has been featured on BBC World News World Update with Dan Damon, he has been interviewed by The Christian Science Monitor, he has appeared on The Dino Report with Dino Costa, and he has been featured on the Seth & Chris Show offering his expertise as a national security and foreign policy specialist. Next What’s In A Doctrine?